COCOA BEACH, Florida — A surfer came to the rescue of a loggerhead sea turtle that was tangled in fishing lines just south of the Cocoa Beach Pier this afternoon. The turtle’s flippers were so entangled that it could be seen gasping for air from the ocean’s surface as it struggled to free itself from the mono-filament. Seeing the marine reptile in distress, a nearby surfer paddled over to help the sea turtle while risking a possible bite from the animal. Loggerhead sea turtles have a bite force so powerful, that they can easily tear through a conch shell – a mainstay of the turtle’s diet. After a few minutes, the surfer had completely untangled the sea turtle and it swam away. Having done his good deed for the day, the surfer then just casually caught the next incoming wave. Loggerhead sea turtles are listed as an endangered species under the Endangered Species Act. your new government!! now with FREE BEER! Thats right Waffle! Good call! #RedSox nation! 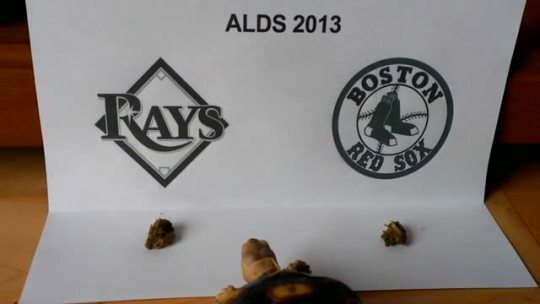 Here is Friday’s pick for the Rays and the Red Sox. And an important piece of information for potential tortoise owners.